We repeatedly have discussions on this list, as on the NSPA list before, of the scope of our mission. Some factions intend to limit the scope of our mission and discussion to addressing the symptoms, rather than the causes, of divorce. Consider whether addressing the symptoms of a problem is as effective a solution as is its prevention by looking at the following. Yesterday was Mothers' Day 1998. There wasn't really too much coverage of the subject on TV, and of what there was and what I saw in moments of channel surfing (the weather is too good to be wasted on watching TV  after all, I must put in a crop), wasn't all good. An example of what wasn't really very good, but rather a violation of our hate-crime laws, was a program produced and sponsored by Johnson & Johnson, broadcast by CTV (in Edmonton, Alberta, at 5 PM 1998 05 10) "Mothers and their Daughters." Why would anyone think of such a title, I thought. Why would anyone not just choose a title of, say, "Mothers," or perhaps "Mothers and their Children"? Why would anyone choose to exclude sons from a topic pertaining to Mothers' Day? I thought that it surely must be something to do with anti-male propaganda and I wasn't disappointed when I watched glimpses of the show. The show, sponsored by Johnson and Johnson, proceeded to cover a case in one of the Arab countries where a father, apparently separated from his wife, tortured to death a daughter of his -- or permitted a step brother of the daughter to be either involved or perhaps even be the main perpetrator in the case of murder. I wonder whether Johnson and Johnson want to sell baby-care products and other products of their line to parents who have sons, or to the vast majority of parents who don't have extremist radical-feminist leanings. I only watched two or three minutes of the show, because I could not stomach the extremes that radical, extremist feminists would go to, to slander men in general on a festival of good will and expression of love towards mothers  by all children! I could not stomach to watch more of it and will ensure that none of my daughters and granddaughters purchase a single item produced by Johnson & Johnson or any of their affiliated organizations. How can any responsible broadcaster stoop so low as to desecrate the relationship between mothers and their children  all of their children  all for the sake of vilifying men, on Mothers' Day! Are there not enough examples of extreme aberrations of parenting right at home? Is that the reason why Johnson and Johnson, along with CTV, have to go to foreign countries to bring horrors into our homes on a day that is devoted to the love and gratitude that all children have for their mothers? Certainly, the responsibility for producing the show was Johnson and Johnson's, but the choice of the time for the broadcast date was CTV's. If we want to look at extremes, there certainly are sufficient examples right in western society of parental love gone wrong. We don't have to go so far to look for them. The report describes the finding of a surveillance of 38 mothers, one stepfather, and one grandmother, of their interactions with children in U.K. hospitals, children who were suspected to be under risk of losing their lives at the hands of their "parents." The survey revealed that in 33 out of the 39 cases, right in the hospital where the video surveillance took place, the monsters who we consider caregivers, attempted to kill or seriously injure their children. Abuse was revealed in 33 out of 39 cases. Intentional suffocation was observed in 30 cases. Amongst the types of abuse were: poisonings (with disinfectant or anticonvulsant); a deliberate fracture; and other emotional and physical abuse. Twenty-eight of the 39 patients undergoing surveillance had a total of 41 siblings. Twelve had died suddenly and unexpectedly. In 11, death was attributed to SIDS (although 1 patient was 22 months of age at death) and in 1 to gastroenteritis. Of the 11 classified as SIDS, four parents admitted deliberate suffocation in 8 of their children after being confronted with the evidence obtained by surveillance of the index child. Two of these deaths by suffocation were caused by stepparents of the children. The death attributed to rotavirus gastroenteritis was subsequently determined by the court to be caused by deliberate salt poisoning by the mother (case 32). Abuse was inflicted without provocation and with premeditation and, in some instances, involved elaborate and plausible lies to explain consequences. We wish to emphasise the plausibility of many explanations and histories given by such parents. For example, one mother (case 13) claimed that she had suffocated her son because of stress related to his crying and continually waking her from sleep. It is possible to empathize with this kind of stress. However, under surveillance, the mother was seen, with premeditated planning, to suffocate her infant when he was deeply asleep. The majority of other cases showed attempted suffocation when the child was asleep or lying passively on the bed. Children did not appear to provoke their parents into abusing them. Maybe the children did not actively provoke their mothers, but it is obvious from the report that the mere fact that these children existed was sufficient provocation for most of the mothers to motivate them to abuse and to attempt to murder their children. Would any of these children have lived if the circumstance would not have been observed? That is extremely doubtful. Time, 12:14 PM: CVS [Covert Video Surveillance] begins. 18:08 PM: the mother is away for the night. 10:50 AM: the mother returns. 12:20 PM: the mother tells the child that if she doesn't stop making a noise she will smack her and "I don't want to do that in the hospital." 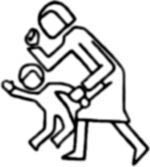 15:18 PM: the mother smacks the child with a toy hammer. 15:26 PM: the child calls 'mummy.' The mother smacks her. 15:27 PM: the mother smacks her. 16:08 PM: the mother deliberately pinches the child who begins to cry and develops breath-holding. She reaches for comfort from her mother but is ignored. After 20 seconds, the mother presses an alarm to call the nurses. They don't appear. The child reaches for the mother again who draws back from her. The mother has a nurse coming but the breath-holding has stopped; she slaps the child hard on the leg. The child cries and the nurse enters the room. The mother appears to be comforting the child. The mother tells the nurse that the child had suffered a small event [of apnea, or stopping to breathe  F4L]. 19:51 PM: the mother says lie down and sleep, then hits her hard on the back. She then immediately strokes the child's back. 19:53 PM: the mother smacks her hard on the bottom, then on the top of leg and says 'go to sleep." 20:03 PM: the child sits up. The mother smacks her and pushes her down by her head. The child cries. 20:09 PM: the mother smacks her on the leg and then pushes tissues up her nose. The child cries. 20:11 PM: the child moves. The mother hits her leg. 20:12 PM: the child talks. The mother hits her leg. 20:15 PM: the mother says "I'm going out. I don't love you any more babe." 20:16 PM: the mother leaves for the night. Time, 11:08 AM: the mother returns. 12:30 PM: the mother smacks her for no apparent reason. The child cries. The mother says "I don't care." 13:14 PM: the mother lies down with the child trying to get her to sleep. The child kicks her legs. The mother smacks her. 13:17 PM: the mother smacks her leg. 13:19 PM: the mother smacks her back. The child cries. She then smacks her legs and face. The child cries more. 13:24 PM: the child settles. The mother leaves. 15:05 PM-. the mother returns. 15:51 PM: the mother says the child is allergic to most foods and milk. 16:02 PM: the mother kisses the child on her head, she cuddles her then smacks her hard on the back. 16:06 PM: the mother smacks her on the back. 16:16 PM: the mother pulls her roughly by one arm from the bed. 17:24 PM: The mother smacks her hard for no apparent reason. 17:27 PM: the mother smacks her hard three times. The child cries. The mother scratches the child on the leg. 17:33 PM: the mother leaves. 17:54 PM: the mother returns. The mother says she has been sick with migraine. 18:07 PM: the mother leaves for the night. Time, 10:40 AM; the mother returns. 11:59 AM: the mother slaps the child hard. 13:28 PM: the mother slaps the child; the child cries. 13:30 PM: the mother is softly rubbing the child's forehead. Suddenly she turns and hits her on the legs. The child cries. 13:41 PM: the mother leaves. 15:40 PM: the mother returns. 15:52 PM: the mother is throwing toy bricks into a box past the child's head. gradually, she increases the force of throwing and then. a brick hits the child on the head. The child cries out in pain and begins to hold her breath. The child reaches out to her mother who ignores her and walks to examine the monitor to see if the child's skin oxygen level is falling. 15:54 PM: the mother picks up the child roughly. She places her hand over the child's mouth for 1 to 2 seconds. She wipes her face hard with tissues. The child is trying to move away but is held tight. The mother then slaps the child hard on the face. The child cries. After 1 minute of crying, the mother cuddles the child. 16:14 PM-. the child walks past her mother who deliberately trips her up with her leg and kicks her in the abdomen and back on three occasions. The child cries and reaches for her mother who initially ignores her and then, suddenly, picks her up and cuddles her. 16:41 PM: the mother changes the child's diaper. The child is passive and lies on the bed quietly for 2 minutes. She then attempts to get up. The mother takes a pillow and forces it over the child's head. The child struggles to breathe. After 8 seconds, the mother removes the pillow but then replaces it for 3 seconds and then lifts the child roughly by the arm. A nurse enters the room after being alerted by the CVS observers. Truly, daughters (as well as sons, as described in the transcripts of some of the other cases in the report) have a boundless capacity to love their mothers. It is astonishing that it happens in some cases, but it is what God intended. As I said before in writing about child abuse by mothers, in the beginning of the sheep production on our farm we had many ewes who were like the mother described in case 34 of Dr. Southall's report. We found that their daughters turned out to be, just like these ewes, bad mothers in turn. Our solution to that problem was to cull rigorously. It was a very effective solution, but it appears that it is not one that we want to apply to humans. It seems that we don't care much about learned aberrant behaviour in human mothers. However, incarceration for a sufficiently long time  for murder or attempted murder of their child(ren)  would break the cycle of violence by keeping these mothers from producing more violent children, wouldn't it? If nothing else, it would prevent them from being repeat offenders and prevent a large number of child abuse and neglect cases. There may be as many or more than 4,000 child murders disguised as SIDS or other "natural" causes of death that occur each year in North America. In Humboldt County, California, the last grand jury report states that 50% of SIDS cases don't meet the specifications of SIDS and that the deaths of the children in those cases occurred under suspicious circumstances. It appears that no charges were laid in any of those cases. The report also stated that autopsies are rarely performed in cases of SIDS, other than that perhaps the little body is put under the fluoroscope to check for broken bones. The latter would rarely be present in cases of deliberate suffocation.